The recent remake of Mad Max: Fury Road has to be one of my favorite examples of both CGI and practical effects in modern day movie making working perfectly together. The way they created this world for which these characters live astounds me every time I see the film and truly set itself apart from other movies. Thanks to behind the scenes access and places like Gizmodo for the latest BTS footage. 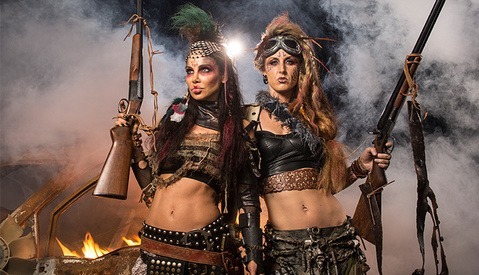 We have posted many times on the film Fury Road here and also here but it never seems to get old. Exploring the world that George Miller created continues to show that movie magic in practical effects is far from dead. I am sure we can each list a dozen big budget movies that we have seen that bring examples of poor post production value when it was unnecessary. 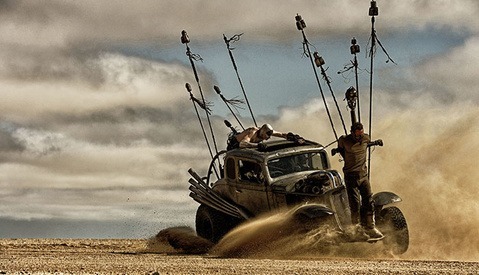 Fury Road just shows that to create something authentic and real you have to go back to the basics and blast away cars in the desert for a few months in hopes of hauling in Oscar nominations left and right for their work in effects. What are some of your favorite films that use both practical and CGI well together? I'm not sure I can name another that rivals Fury Road. Hope that George Miller does a sequel soon! Fury Road blew my socks off! As far as some of my favorite films with practical/cgi vfx pretty much any David Fincher film perfectly and seamlessly blends CGI in camera-it's pretty surprising how much is done in post for his films. By special fx you really mean visual fx. They are 2 different things. Yes, this comes from the photo guy. Not too familiar with the film side of the busines but learning. Thanks!